This article, by Rosário Salema de Carvalho, is the result of an ongoing research project and aims to draw attention to simulated Portuguese azulejo frames. The Portuguese word azulejo refers to a tin-glazed ceramic piece, generally of square shape and used in the decoration of walls. Since azulejo does not mean simply tile, it is preferable to use the original word. In Portugal and the regions where the country’s influence was felt, this ceramic element is linked to a specific architectural use, and became one of the most representative art forms of the Portuguese cultural heritage. The specificity and originality of this artistic practice is also visible in its longevity (azulejos appeared in the 15th century, on floors, and went on being used without interruptions until today), in articulation and dialogue with other art forms, in iconographic programmes (azulejos are used in wall decorations depicting long narratives inspired by European engravings), in transcultural exchanges, and in the renovation of tastes and trends throughout the centuries. Ever since the 16th century, and up to the present day, azulejo compositions have always used frames as a means of organizing and enclosing figurative, ornamental or patterned compositions, just to mention the three main axes in the development of this kind of decoration. Of course these are not conventional frames, but their role is also to separate, isolate, join together and articulate different decorative elements. As was emphasised by Rosário Salema de Carvalho in the introduction to ARTisON’s special issue no. 2, while it is true that frames stand for order, in the case of azulejo decorations this is to be understood in a much wider sense. In this context, frames also stand for integration, articulation and dialogue with other artistic modes of expression, often leading to global decorative solutions. 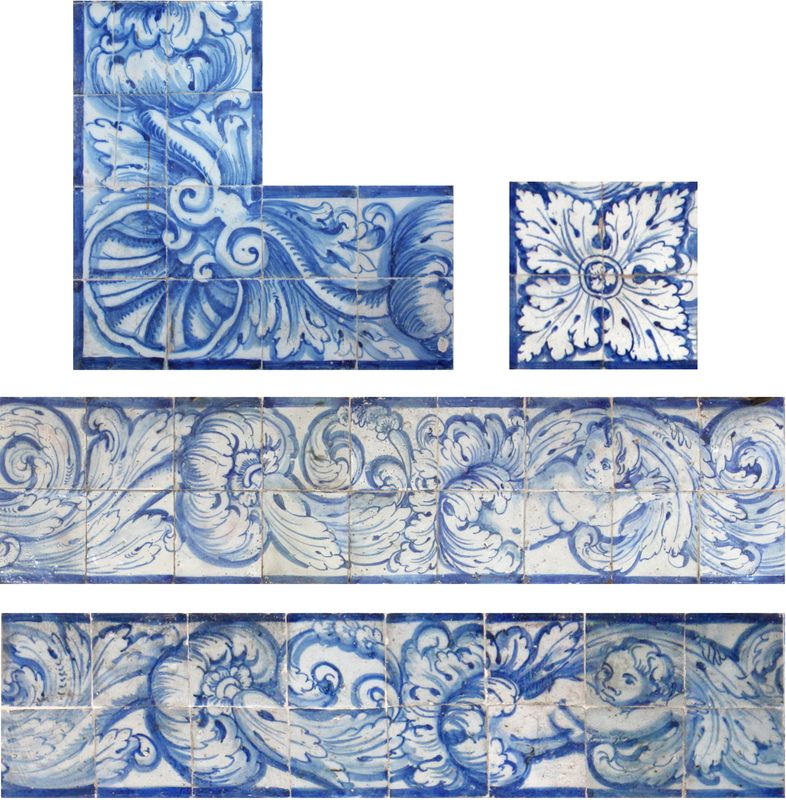 This article (together with ‘Frame simulations in 18th century Portuguese azulejos’) was published in the proceedings of the AzLab#14: Azulejos and Frames, a seminar organised by the research group Az – Rede de Investigação em Azulejo (ARTIS – Art History Institute, Faculdade de Letras, Universidade de Lisboa). This one-day conference aimed to discuss azulejo frames, whose diversity of solutions can be explored in the published volume. This particular article is republished here courtesy of the author, Rosário Salema de Carvalho. The present article focuses on the cataloguing of Baroque azulejo frames and aims to explain the methodology of the project as well as the expected results. I will discuss the importance of cataloguing and the system used – Az Infinitum – Azulejo Indexation and Referencing System. I will also address the different cataloguing options, some of which came from conclusions drawn during the actual cataloguing work. I will also assess the benefits offered by this kind of systematisation for the study of azulejos and related decorative systems within the context of the Baroque concept of artistic totality, which is typical of Portuguese interiors from the last decades of the 17th century to the first decades of the following century. O presente artigo apresenta o projecto de catalogação das molduras em azulejo do periodo barroco, procurando explicar e justificar as principais opções metodológicas seguidas e os resultados esperados. Discute-se a importância da catalogação e o sistema utilizado – Az Infinitum – Sistema de Referência e Indexação de Azulejo (redeazulejo.fl.ul.pt/pesquisa-az), assim como as opções de catalogação, algumas das quais resultantes já de conclusões de trabalho efectivo, avaliando as potencialidades que uma sistematização deste género pode trazer ao estudo da azulejaria e dos sistemas decorativos, entendidos no contexto da totalidade artística barroca que caracteriza os interiores portugueses entre as décadas finais do século XVII e as primeiras da centúria seguinte. Just like azulejo decorations, azulejo frames must be considered in context, that is, in their original location, in articulation with the architecture and other artistic modes of expression (fig. 1). Whether in the form of double, single, half azulejo frames and mouldings (rectilinear or sinuous) , frames constitute key elements in the organisation of these complex decorative systems. They are therefore well worth cataloguing and studying, both individually and on a wider level, highlighting their integration with the surrounding space. Only such a global understanding, focused on the dialogue between different artistic modes of expression, can help grasp the Baroque concept of artistic totality , typical of Portuguese art from the late 17th century to the first decades of the 18th century . The main goal of the ongoing research project ‘Cataloguing Baroque azulejo frames’ is to create a database of azulejo frames from the Baroque period, applied in Portugal (including the archipelagos of Azores and Madeira). Through the systematisation of existing knowledge, we hope to be able to answer, or at least to shed some light on, in the near future, several issues concerning the manufacture of azulejos in Lisbon workshops, the commissions, the articulation between artistic interventions, the main trends and taste of the period under analysis. The paper will discuss the chosen methodology, including the cataloguing process, with the aim of assessing the benefits that this kind of systematisation can offer to the study of azulejos and the decorative systems they are part of and with which they interact. 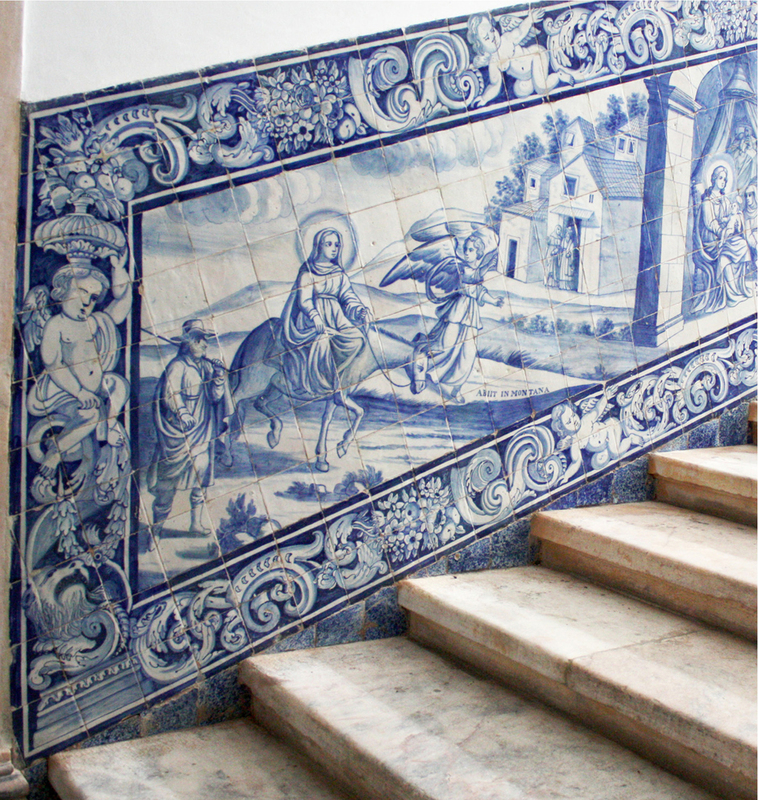 During the 20th century, the Portuguese study of azulejos managed both to find its own place within Portuguese Art History and to distinguish itself from the study of ceramics as an independent research field. These two achievements were greatly due to the work of João Miguel dos Santos Simões [1907-1972] (Carvalho, 2007: 237-254), who is also credited for underlying the importance of inventories as a way of laying the ground for a systematic and accurate study of azulejos. To a great extent, it is thanks to this legacy that today’s research on azulejos is able to offer multiple approaches to a series of complex challenges, inherent to tile production itself. These challenges include, among others, a very wide time-span (from the late 15th century to the present day); technical and material issues related (or not) with tile manufacture; a transcultural dimension, especially noticeable during certain key moments of intercultural interaction, exchange and syncretism (Meco, 1998-1999, 8-17; Pais and Monteiro, 2013, 59-64); the articulation and dialogue with architecture and other artistic forms; the networks of artists and commissioners; and the participation in global decorative systems. Azulejo studies are a “complex problem”, which – just as Santos Simões had suggested, anticipating what can be defined in today’s language as computational thinking (Wing 2011) – can therefore benefit from the compartmentalisation into sub-problems, easier to analyse and interpret. 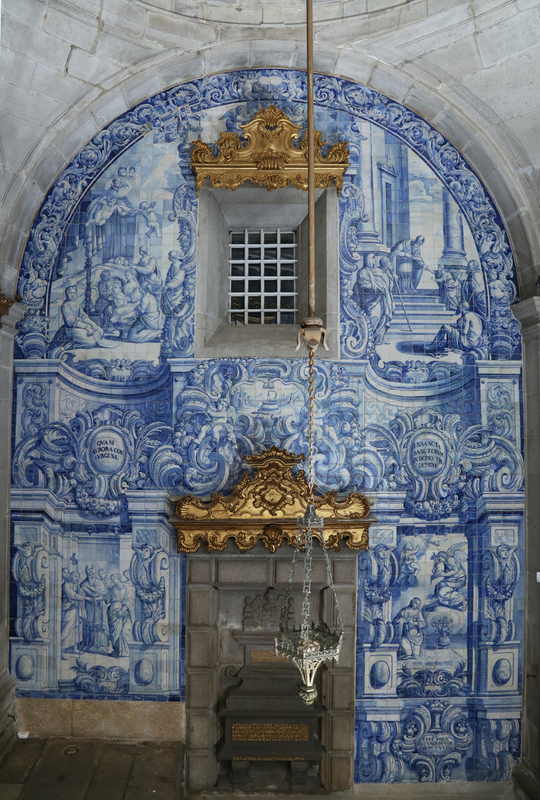 Consequently, it was decided, drawing on Santos Simões’ legacy regarding 17th century patterned azulejos (and frames) (Simões 1971) – already used as inspiration for the project Catalogue of Portuguese azulejo patterns  – that the same methodology should be applied to Baroque frames. The new project, outlined below, centres on the repetition of double and single azulejo frames, and mouldings models (or simply isolated motifs) recurrent throughout the Baroque period but never truly systematised. Resorting to a relational database – Az Infinitum –, the project integrates the challenges of what is currently called “Digital Art History” (DAH) (Zorich 2012), a field of research addressing new questions and developing new interpretative models, beyond the scope of the so-called “Digitized Art History” (Drucker 2013: 5-13). 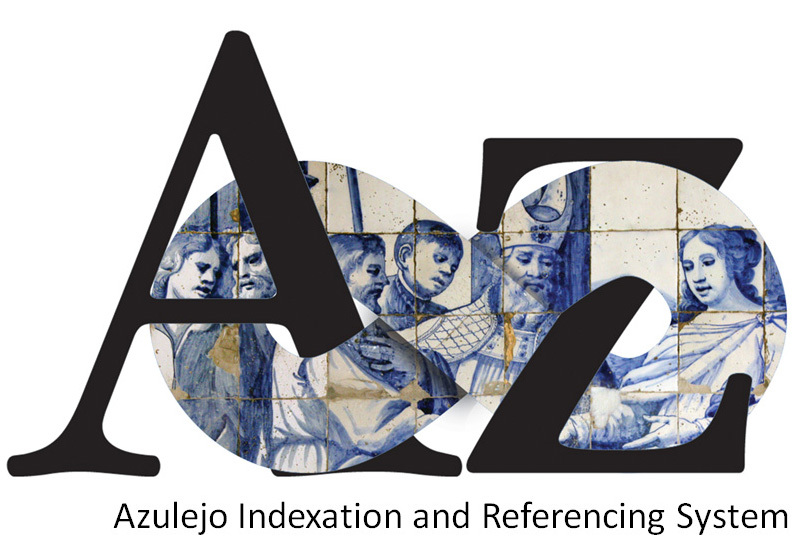 The Az Infinitum – Azulejo Indexation and Referencing System  (fig. 2) is a routinely updated computer system specifically designed to gather data about azulejos. This relational database enables users (both researchers and non-experts) to query data about the locations where azulejos were applied, the decorative motifs (either the iconography or the patterns), the authorship, chronology, materials, techniques, and the documentation associated with each example. It is organised according to five major areas: In situ, Patterns and Frames, Iconography, Authorships and Bibliography. 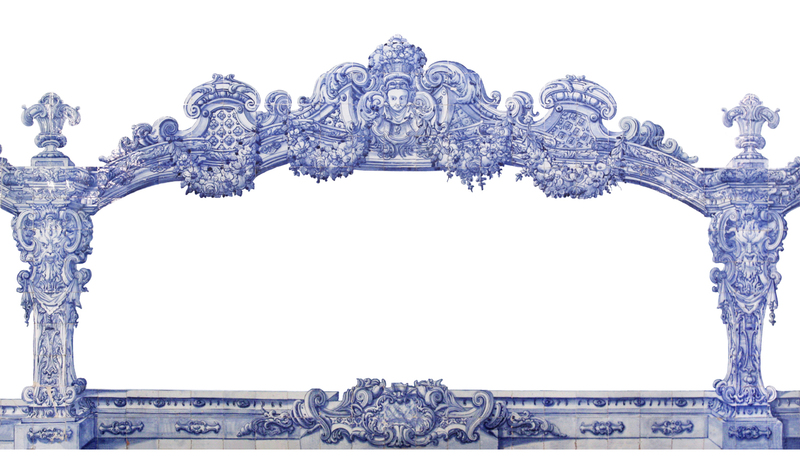 Baroque frames can be found in the ‘padrões e emolduramentos (patterns and frames)’ tab, but link to all the other tabs, particularly to the ‘in situ‘ area, displaying tile decorations still found in their original locations. For each frame it is thus possible to determine with accuracy ‘where’ (a given frame was applied), ‘when’ (whenever a date is available) and ‘who’ (whenever the author is known). 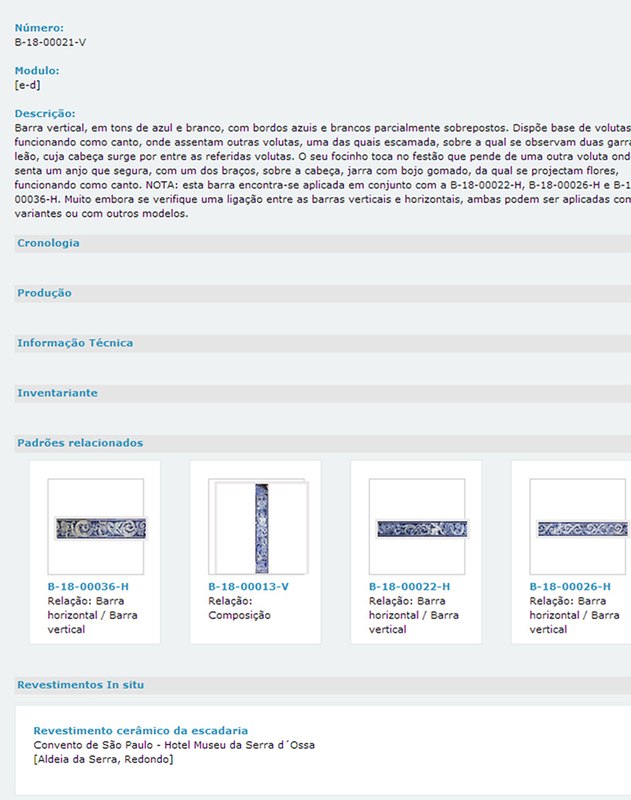 Frame cataloguing provides a controlled vocabulary for the indexation of Portuguese in situ tile decorations, which makes it easier to find and access the existing records. However, the way in which the data is structured and interconnected also allows users/researchers to view it from various angles, to ask questions and to think in different modes. A file is created for each frame and given an alphanumeric code, linked to a visual sample (a manipulated digital image) of the frame. In addition to a brief description and the subject indexation following the Iconclass system , the file also includes information about chronology, authorship, manufacture and technical information. As mentioned above, the frame’s location is indicated through its articulation with the in situ area and through the comparison with other examples with similar compositions and decorative motifs. 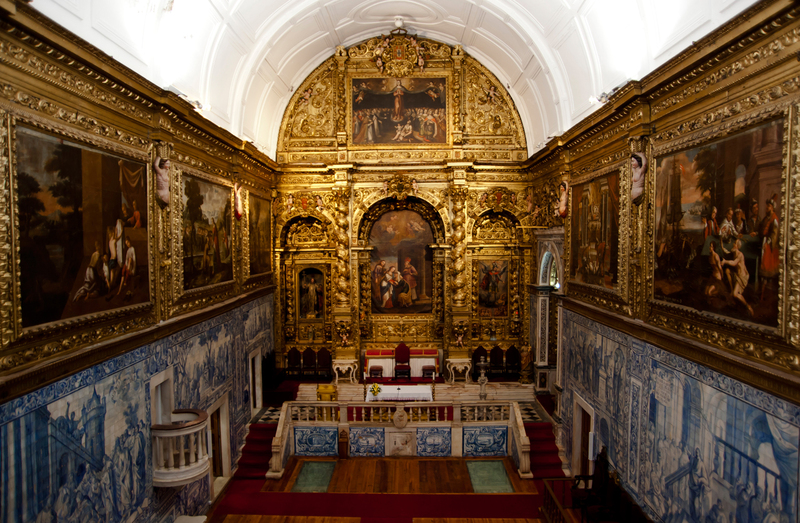 The frames dating from between the last decades of the 17th century (Transition Period, already in blue and white) and the first quarter of the 18th century (Masters’ Cycle) adopt the traditional scheme of double, single or half azulejo frames (the last one rarely used), articulated with corner tiles (fig. 3). However, there are some variations especially in the painting technique. During the 17th century, azulejos were painted individually, according to an initial drawing repeated as many times as necessary (fig. 3). This means that in order to obtain a continuous double azulejo frame made of four alternating azulejos, the artist simply copied the four designs, azulejo by azulejo. 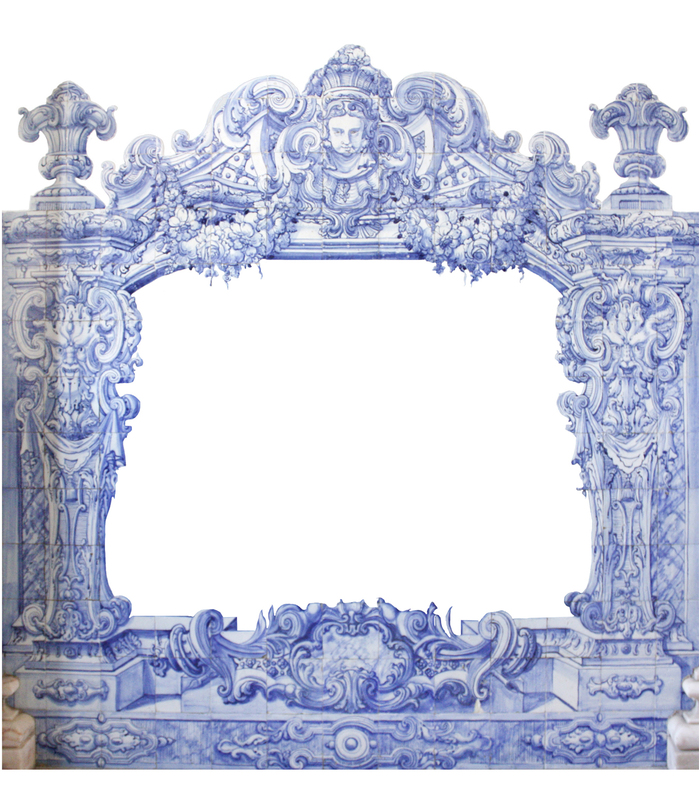 In repeating Baroque double and single azulejo frames, this technique co-exists with another one, in which frames are painted throughout the frame’s final length. 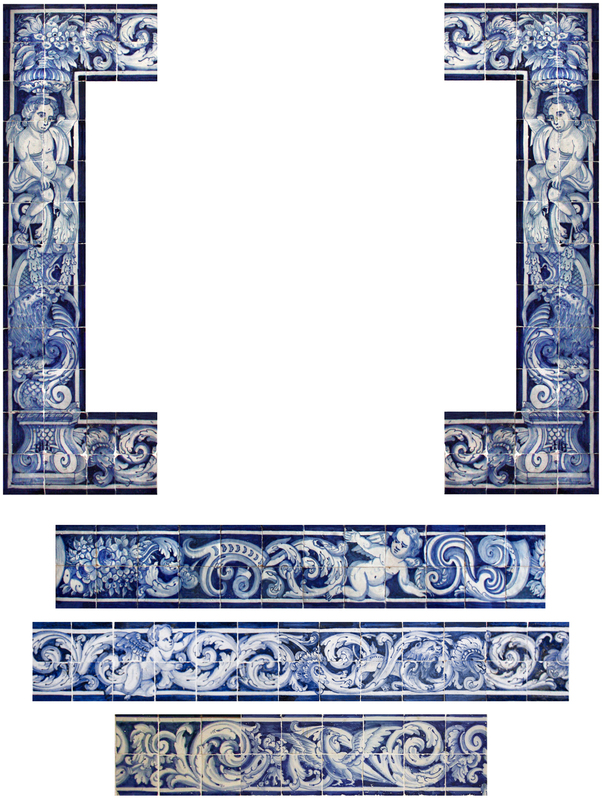 In these cases, although the decoration does follow a sequence, the scrolls of acanthus, for example, occupy different places within each azulejo. More importantly, the articulation between these double and single azulejo frames and the corner tiles is not so strict, allowing for more variations (fig. 4). Furthermore, this methodology requires a more specific painting technique, conditioned by the decoration’s length, even though the frames are still relatively independent from the figurative section. In short, whereas in serial frames the double azulejo frames, corners, figurative sections and place of application remain independent from one another, and whereas each of these elements can even be carried out by different artists, in the second model frames tend to become specific, adapting to the surrounding space and are prone to interdependency that will increase over the years. The alphanumeric code ascribed to each frame consists of a letter – B for double azulejo frames, C for single azulejo frames  and F for half or third azulejo frames – followed by the century in which they were produced – 18, in this case – and by a sequential number with five digits. With time, frames grow increasingly complex, with acanthus scrolls and other decorative motifs applied both vertically and horizontally, giving rise to specifically horizontal or vertical double azulejo frames, complete with architectural and sculptural simulations. 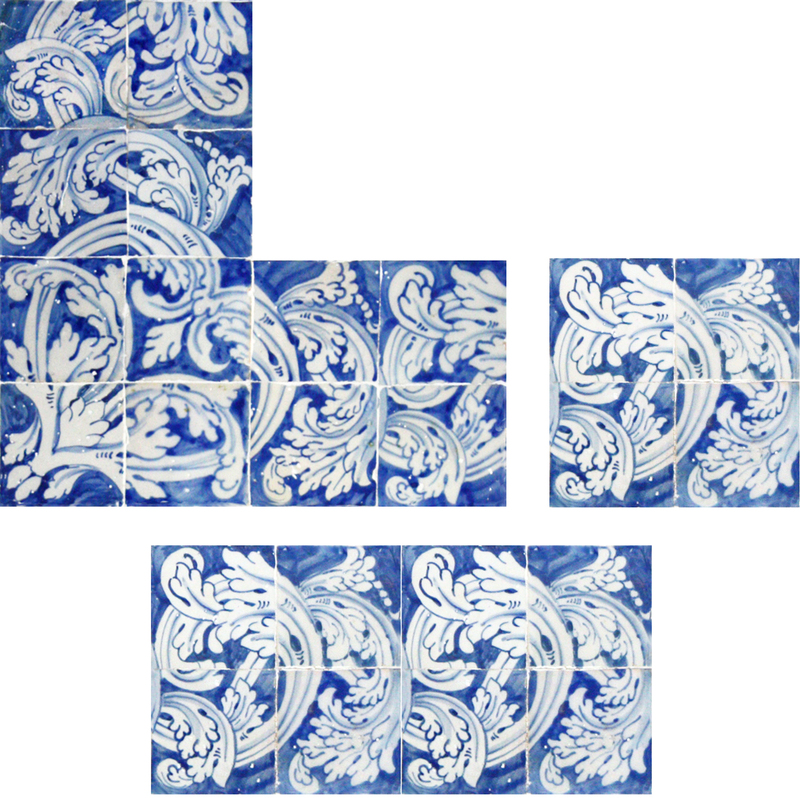 While vertical double azulejo frames have a left and a right side, horizontal ones, usually repeated above and below, display a central motif (also catalogued), with the left and right sides mirroring one another. According to each design, the corners are either integrated or independent. However, contrary to what might be expected, there are only slight drawing variations allowing for the articulation of the same vertical double azulejo frames with different horizontal ones, and vice-versa. These cases required that the double and single azulejo frame’s alphanumeric code be changed and that an H (horizontal) or V (vertical) be added to the sequence number, along with the indication of the other double azulejo frame with which it can be combined (fig. 5a). In this example, of double azulejo frames B-18-00021-V and B-18-00022-H, the B-18-00021-V can be applied with the B-18-00026-H and B-18-00036-H. The specificity of these decorations also led to the definition of a new decorative type, namely mouldings. Generally speaking, mouldings are ‘enclosures that function as a whole, usually indented and articulated with the painted section and/or panels’ (Carvalho et al., 2014), and that cannot be divided into separate parts. A moulding code is similar to the one mentioned above, but the letter used is M. The task of cataloguing mouldings is much more complex and problematic than the previous ones. The first problem relate to the moulding length. It was determined that the cataloguing should focus on the lengthiest known examples, with the shortest examples viewed as condensed versions thereof, duly adapted to the surrounding space (figs 6a & 6b). The ease with which these mouldings are transformed, in response to the requirements of each situation, seems to indicate the pre-existence of a wider model, which is why the longer moulding was chosen for cataloguing. However, while in the previous cases the frames and the figurative sections remained relatively independent, these examples display a complete interconnection between the different areas, painted together and mutually overlapping. Some specific elements are indeed copied and the profusion of motifs with architectural and sculptural simulations, textiles, angels, animals, cartouches, etc. render these frames very complex and prone to slight variations that can nonetheless have a strong impact on the final decorative solution. The mouldings indentations, both internal and external, attest to a decorative conception different from the previous one, favouring wainscoting solutions rather than overlapping compositions covering entire walls (Santos, 1957: 129-131). It is also worth mentioning that, in certain cases, mainly within the context of the Great Joanine Production, the definition of frames as compositions enclosing sections applies to a solution that is relatively frequent, albeit impossible to catalogue. It is the case of imaginary architectural compositions taking up entire walls and enclosing figurative scenes (fig. 7). In these solutions, the surface of the wall is regarded as a whole containing both the real and the imaginary architectural elements, the latter painted on the azulejos and articulated with the former ones, in order to create a simulated architectural structure wherein the depicted narratives take place. (c) azulejo wainscoting with an indented upper edge. These systems influence the organization of space and the perception of the enclosed narratives, but they also enable us to determine whether there were different ways of conceiving Baroque interiors – either globally or cumulatively – within the context of the artistic totality that defines them. Finally, when the frame catalogue is cross-referenced with the location of each decoration, another indexation is used, focusing on the way each decoration interacts with the surrounding space. Two different lists enable the identification of the decorative system to which a given frame was applied, as well as other details, namely the existence of a single line signalling the limits (since there are identical models with different limits, which we chose to catalogue together). This last aspect influences the impact and final effect of the work, particularly the tri-dimensional effect it aimed to produce, highly relevant to our current research. This indexation, based on the application of each decoration, will allow us to determine the dominant trends of the period under consideration. As mentioned above, the setup of this cataloguing system followed very specific requirements. As such, it is not impartial and neutral. In the present article, I have merely explained the main options followed, some of which are already being implemented within the project. Even without referring to concrete examples, the new methodology itself allows us to substantiate a series of aspects that were hitherto only intuited. These newly revealed aspects include the different painting techniques, the tastes and trends, as well as the importance of the use of perspective, among others. They are also related with wider questions such as the clear definition of decorative systems, the painters’ and tilers’ work methods, or even, for instance, the process whereby a religious interior was commissioned, involving the cooperation of craftsmen of various kinds. In the near future, once the catalogue is concluded, it will be possible to accurately account for the evolution of frames throughout a long time-span (pinpointing continuities and breaking points) and for the more popular models. It will also be possible to determine whether frames were shared by different workshops; or whether there might have been an initial cooperation between different workshops within the same work, one of them in charge of frames and the other of figurative sections; which sources of inspiration were used; the nature of the relationship between tile painters and woodcarvers, given the dissemination of motifs between these two artistic forms, etc. In fact, even though today historiographers regard frames as elements devised to integrate decorations within space, in the Baroque period they were seen as marginal elements, outweighed by history paintings, organized in long narrative sequences inspired by engravings circulating across Europe. Be that as it may, this project’s first results attest to the importance of frames for the spatial structuring of decorations – organizing them, interacting with the surrounding space and thus playing a decisive role in the decorative systems they are part of. Therefore, by addressing this problem within the context of a wider research focus, and by introducing a high level of systematisation, we hope to be able to contribute to a renewed and more consistent assessment of Portugal’s Baroque tile production. DRUCKER, Johanna, ‘Is there a “digital” art history?’, Visual Resources: An International Journal of Documentation, 29 (1-2), 2013, 5-13. Available in 10.1080/01973762.2013.761106 (2015.01.28). MECO, José, ‘Expansão da Azulejaria Portuguesa’, Oceanos. 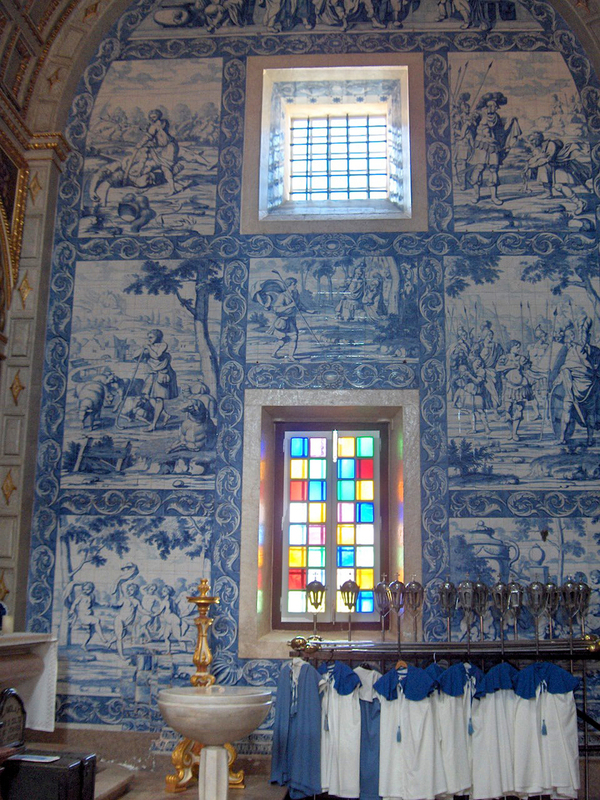 Azulejos Portugal – Brasil. 36-37, 1998/1999, 8-17. Rosário Salema de Carvalho is a researcher and executive coordinator of Az – Rede de Investigação em Azulejo / Azulejo Research Network (from ARTIS – Instituto de História da Arte, Faculdade de Letras, Universidade de Lisboa, Portugal) and coordinates the projects related to tile studies and inventory, in collaboration with the National Museum of Azulejo (Lisbon) and also with the company “Sistemas do Futuro”, for the development of a special database for an azulejo inventory. She has been doing research on heritage, especially in the area of Portuguese azulejo, and wrote several articles. 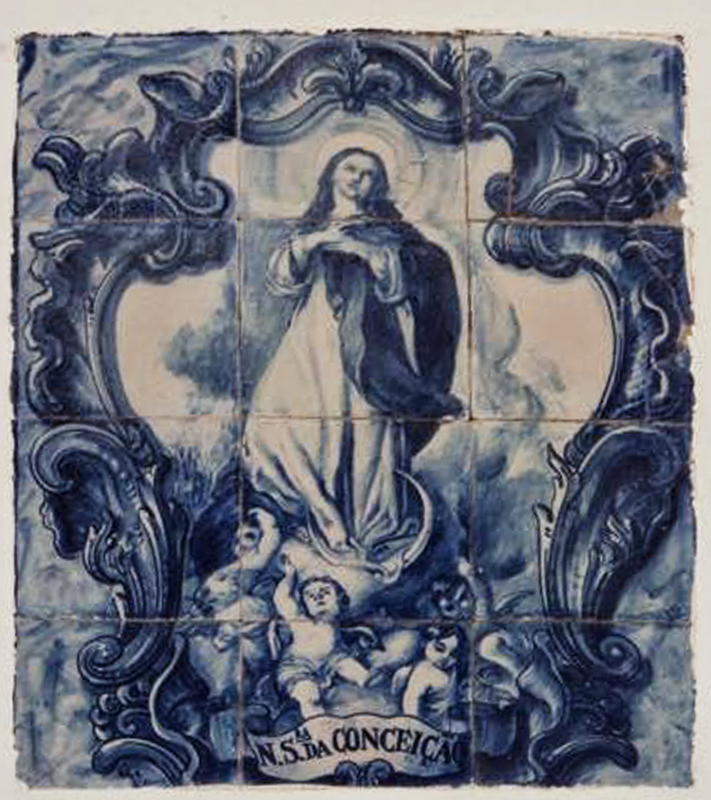 Her PhD dissertation in History of Art was dedicated to one of the most significant periods of the history of Portuguese tiles, including the so called Masters’ Cycle (1675- 1725). Currently her main research focus is on azulejo frames in collaboration with the National Museum of Azulejo, Lisbon (see complete CV). In Portugal, frames or border tiles are divided according to their shape and mode of application into “barras” (double azulejo frames), “cercaduras” (single azulejo frames), “frisos” (half or third azulejo frames) e “cantos” (corner azulejos). We added a new one, the mouldings. The term refers to the combination of different artistic modes of expression used in the creation of decorative systems and iconographic programmes. The period under analysis is divided into at least three cycles, all exemplified by the blue and white painting that will remain until the middle of the 18th century: (1) Transition Period (1675-1700) exemplified by the appearance of the first examples of paintings exclusively in blue and white; (2) Masters’ Cycle (Ciclo dos Mestres) (1700-1725) exemplified by quality and erudition of the painting; (3) Great Joanine Production (Grande Produção Joanina) (1725-1750) exemplified by the more scenographic decoration. The ongoing work can be followed on the platform Az Infinitum – Azulejo Reference and Indexation System. This online database, coordinated by the author and Alexandre Pais, is the result both of the work carried out by five researchers and of a partnership between Az – Azulejo Research Network (ARTIS-IHA/FLUL), the National Azulejo Museum and the company Sistemas do Futuro. The C relates to the Portuguese word ‘cercadura‘. The other terms have the same initial letter in Portuguese and in English.